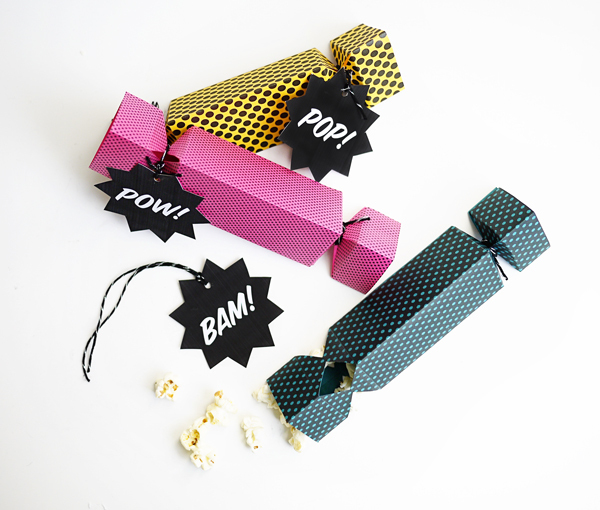 This New Years, surprise your friends with poppers that are filled with… popcorn! These poppers are easy to assemble and can be made in any color you choose. You’re friends will love these treats even if they are a bit “corny.” Ha! 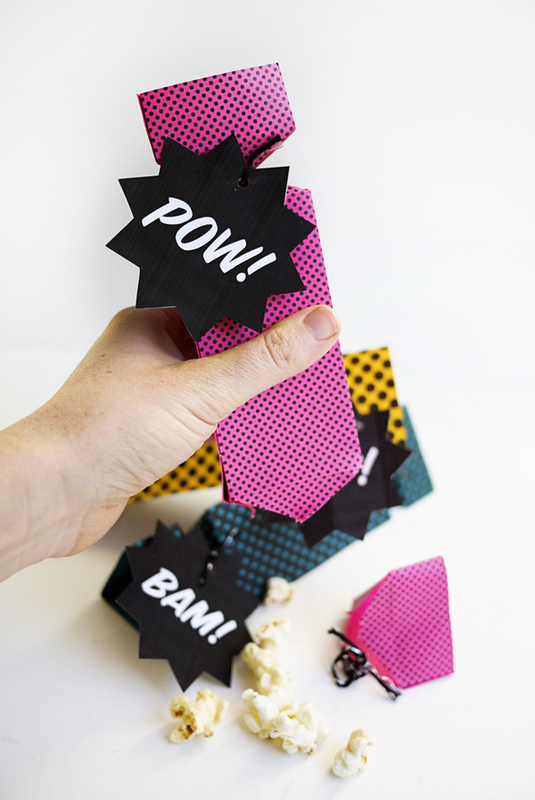 Materials: Printable Popcorn Poppers, 3 pieces of 8.5 x 11 colorful card stock, 1 piece 8.5 x 11 white card stock (for tags), ruler , craft knife , scissors , glue (not pictured), bone folder , screw punch or hole punch, string . 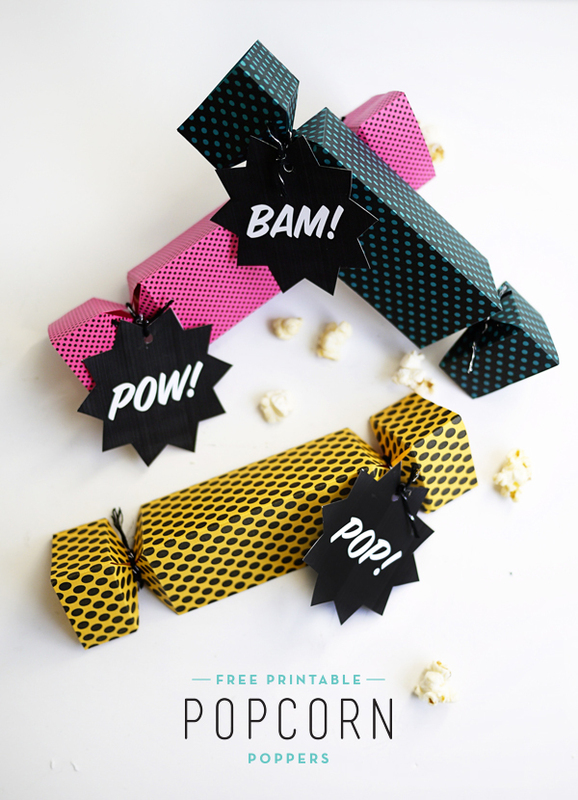 Step 1: Print out the Printable Popcorn Poppers on 8.5 x 11 colorful card stock. Step 2: With the bone folder, score all indicated fold lines on the popper. The score lines will go through the center of the triangle shapes and then perpendicular above & below the triangles (see template). Step 3: Using the craft knife, cut out the popper template. Step 4: Fold all of the scored lines on the popper using the bone folder. Step 5: Cut out the triangle shapes by folding each side and cutting with scissors (see photo for detail). Step 6: Use bone folder again to fold the scored lines that are above and below the triangles. These will be the ends of the popper. Step 7: Glue the small flap and assemble the triangle shape popper by pressing the small flap under the large flap. Allow glue to dry. Step 8: Once the popper has dried, press the triangle cut-outs inward and tie off one side with pretty string or ribbon. Step 9: Stuff your popper with popcorn! Cut out one of the “pop” tags and punch a hole in the top using the screw punch or hole punch. Step 10: Tie off the popper some with the tag and string. Super cute. I love this! My kids are all about these poppers lately, so I bet they would love these too! Thank you so much for sharing these free goodies with us. Timely for me. My husband’s 30th is coming up and he is a HUGE popcorn fan. So cute! And thanks for the printable. Going to use these at New Year’s! I love popcorn! What better way to enjoy my favorite treat ….popping it open! Love Love!! 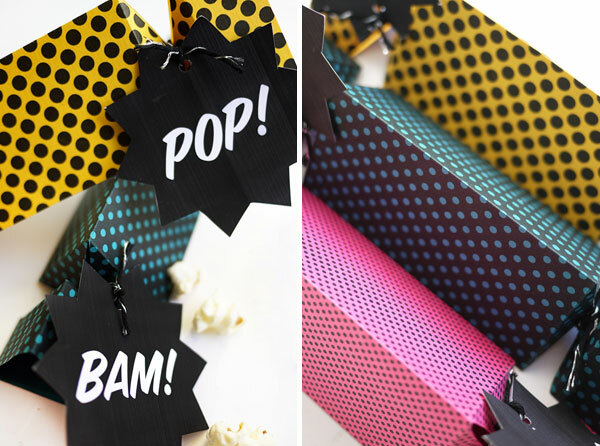 such a cool pop art twist on the Christmas popper tradition! Such a great idea, love the pop-art style too! These look like so much fun! I am going to be planning a baby shower with the “she’s ready to pop” theme, and these would be such a great addition to the theme and fun for the guests. I think I will use the “POP” tag on all of them. Thanks so much for the template and the easy-to-follow tutorial! What a cute idea. I am pretty new to your blog and was browse through your previous stuff. I hope your holidays are going great. Im new to your bog so I just want to firstly say Hello. I love the brightly coloured design of your blog, looks awesome!! These poppers look fun. Remind me very much of Crackers, (a tradition we have in England, where we pull Crackers at Christmas dinner, and inside there is a little gift, a paper hat or crown and a joke). These are like a modern, geometric version, which I love! ), just without the snapper to make them go bang when pulled. Great tutorial. 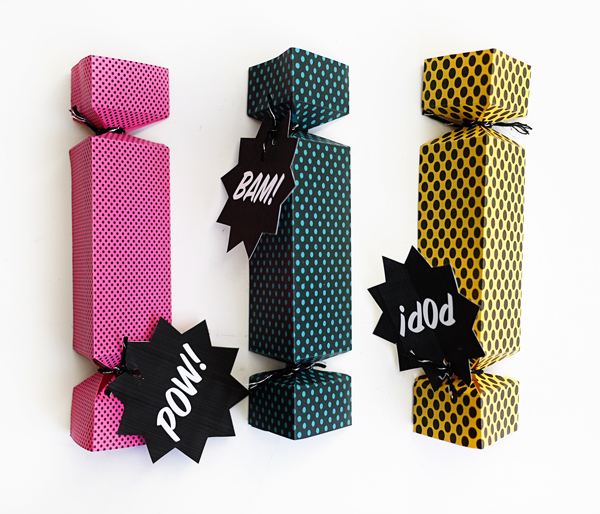 These look like the Christmas Crackers that is popular in the UK. It would be fun a fun addition to your poppers (similar to small firecrackers and come in strips that you can buy for these DIY Xmas cracker projects) that make make the loud popping noise when you pull it.